Recent times have seen businesses attempt to diversify their operations and target markets due to the economic instability. This has led to the emergence of new markets around the world, known as the BRICs, focusing on Brazil, Russia, India and China. 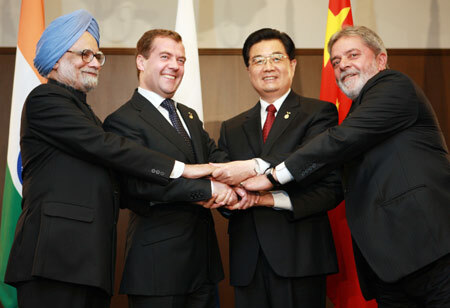 As a result, the BRICs now represent one-third of the world’s total gross domestic product and with this naturally comes increased fossil fuel use and pressure into tackling carbon emissions; the BRICs account for 33% of global energy use and produce 37% of worldwide carbon emissions from fossil fuel combustion. These countries are the current growth centres in our free market and face grave responsibility in trying to limit the release of GHG’s from this process and create a blueprint growth model based on sustainability for future markets. So what do they have planned? Brazil has quite a unique emissions profile. With 85% of its electricity coming from renewable sources and a transport matrix heavily dependent on biofuels it still accounts for 2% of global emissions, mainly from deforestation and agriculture. In an attempt to curb these increasing emission values, Brazil has committed to reducing its carbon emissions by 36-39%, on its 1990 level, by 2020 under the Kyoto Protocol but didn’t sign an agreement on the Kyoto extension framework. Financially, a national Climate Change fund has been set up for projects reducing GHG emissions, with an initial investment of $585 million in 2012 – due to rise to $1 billion in 2014 – and the first Latin American emissions trading scheme is due for implementation in 2013 within Rio de Janeiro. In 2011, Russia produced 5% of worldwide emissions placing them forth in the rankings. Unfortunately they have opted for postponing action on this figure by declining to join the second commitment period for the Kyoto Protocol and allocating their resources to the ‘Durban Platform for Enhanced Action’, a UN plan due to begin talks in 2015 with a roll out date in 2020. Even with Russia producing significant amounts of GHG’s they are still 37% below 1990 levels due to the economic downturn after the collapse of the USSR. This is partly to blame for a muted domestic approach to Climate Change policy with only the non-legally binding ‘Climate Doctrine’ aimed at improving energy efficiency and creating a domestic carbon market. India now accounts for 6% of global carbon emissions, currently due to sky-rocket when population and economy follow suit, but they are keen to emphasise that based on per-capita emissions their contribution is much smaller. This could be construed as an attempt to keep their position as a developing country in global Climate Change discussions. The main government initiative to reduce India’s emission intensity is the National Action Plan on Climate Change, containing eight ‘missions’ including promoting solar power, increasing energy efficiency and forest coverage and raising awareness of problems associated with Climate Change. There are currently no binding emission targets but a voluntary cut of 20-25% of the emissions intensity of their GDP by 2020, based on 2005 levels, is in place as well as a commitment to the Durban Platform for Enhanced Action. China is a double edged sword. It splits excessive carbon consumption, 29% of the world’s total in 2011, and unrelenting coal mining plans in the North-western Provinces with tremendous amounts of investment in renewable energy projects and the largest number of Clean Development Mechanism funded projects. So where does it stand heading into the near future? It is exploring new policy options with Pilot carbon trading schemes in seven provinces and cities due to be launched from 2013 with the EU helping the design, but a national scheme does not look likely to be implemented before 2016. In 2007, China launched a National Climate Change Program to mitigate GHG emissions and the 12th Five Year Plan aims to generate 15% of their energy from renewable sources, and apply a 17% reduction in their carbon intensity, by 2015. However, China’s commitments to emissions control over the next decade are not subject to legally binding international frameworks, so prepare for a couple of changes. Nathan Shaw holds a bachelor’s degree in Mathematics from the University of Bath but has since concentrated on pursuing research in worldwide environmental issues. With a particular interest in the science of Climate Change and it’s effect on developing nations, he plans to undertake a Masters of Research degree in September. Nathan is currently involved with local environmental organisations in his home county of Dorset, England - aiming to inform and educate people on the benefits of a sustainable life.